Waikaia Gold is pulling the pin on its gold dredging operation in northern Southland, and is scheduled to finish up in March. During the past more than five years Waikaia Gold has taken well over 2 tonnes of fine alluvial gold from about 150 hectares of paddocks near Freshford, a few minutes downstream from the township of Waikaia. 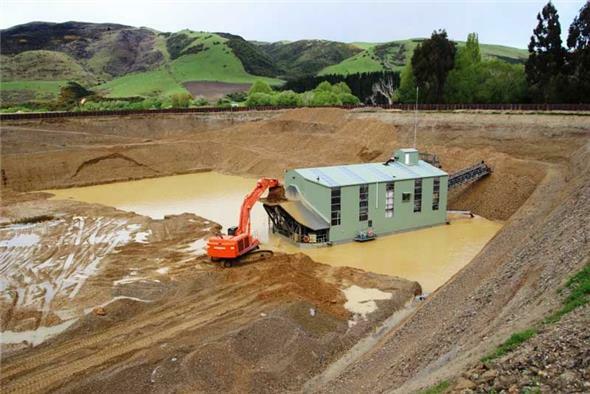 Mine manager Noel Becker said a total of about 75,000 ounces of gold was taken by the 270-tonne purpose built floating dredge, which sat in a pond and worked its way across farmland paddocks, at depths of up to 20 metres. “We're rushing headlong to oblivion; we'll be mined-out by March,” he said. “That (fourth phase) could have given us another year's work,” he said. Becker said the company was looking at “another couple of areas” to mine, but declined to disclose where they were. If mining elsewhere was not undertaken, the company would put the 42m long dredge, sheet piles and diggers up for sale, while the big haulage trucks belong to a contractor. Waikaia Gold began in November 2013, as an $18 million start-up, and within 22 months had gleaned its first tonne of gold from the farmland, at depths down to 16m-20m. At Wednesday's gold price of $US1,284/oz ($NZ1,899/oz), the total 75,000 oz would have been worth $US96.3 M ($NZ142.4 M). In mid-2016 a gold production room, workshop and offices were destroyed in fire at the Freshford site, estimated at the time to have cost about $500,000. In November 2015 a worker operating earth-moving machinery at the mine was killed and his employer, a Reefton-based earthmoving company, later admitted failing to ensure the safety of an employee. “The operation will go flat out until the end, then turn to (land) rehab.” Decker said. A small “lake” has been left behind in a paddock near Freshford. Becker said the paddock-bound “lake” was an amalgamation of several former dredge pits, and was consented for. While the local farmer was not in need of an irrigation dam, Becker said the 4 ha lake could become a community asset. Land rehabilitation would continue after March, and depending on the weather, may not be finished until next summer. Noel Becker said while the mine permits went through to 2022, he expected they would be left to lapse. Noel Becker presenting at the AusIMM NZ Mining Conference in 2015. 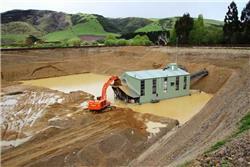 The Waikaia dredge in action.